Elmo, TX Ukulele Lessons Near Me | Fun Classes. Top Teachers. Check out some of our most popular teachers near Elmo, TX including Dallas, Plano, Irving, Grand Prairie and Carrollton. After 30 years of guitar playing, I recently bought a uke. I can't believe how much fun it is and pretty easy to get started on. Give me 30 mins and I'll teach you 2 songs on your first lesson! 26 years professional experience as an actor and comedian. Playing guitar for 30 years. I will help you get as far as you want to go! I am laid back with a serious approach.A fellow actor recently mentioned to me how acting is stressful, I had never thought about it until then and he's right! The stress has never bothered me though because I always am very prepared. I will teach you the skills to be prepared and well rehearsed so that the performance comes easily. I do not teach music theory but I can teach you to play guitar or ukulele. I own 5 guitars, a ukulele, a mandolin and a keyboard. They just need a guitar. Classic Rock, Oldies, Pop Rock, Pop, R&B, Travis Picking and other types of finger picking. I hired Dan to teach guitar to my 13-year-old godson and I cannot be happier. Dan is everything he wrote in his profile and more. He was definitely prepared and he was patient and he really connected with my godson. After he left, my godson was extremely excited and happy that I hired Dan to teach him guitar. Excellent first lesson. I enjoyed it a lot. Come learn to play the ukulele with me! This is a very fun instrument that is very popular right now. With just a few chords you can play along with your favorite songs or accompany yourself singing! Easy peasy and so much fun! Have fun learning uke. I teach finger-picking, strumming, counting and riffs to play your favorite songs with ease!! I have been teaching for over 20 years. I am a singer-songwriter-guitarist and performer. A native born Southern Californian, her life focus has always been music, from her beginnings as a little girl in the church choir to playing guitar in her first all girl band by age 12. She received her formal classical vocal training with Pollyanne Baxter at Cal State Los Angeles, where she received her BA in Music. Over the years she has performed her original music in coffee houses, and other venues. I have performed for Weddings, Church Services and Musicals. My latest endeavor is Ruth in The Pirates of Penzance! I also love writing music and working with collaborating with others. I have been teaching for a long time now and enjoy working with people. I structure the lessons to fit my student's needs and interests. Everyone learns differently and I like to make the lessons enjoyable while developing a solid foundation. I teach note-reading and incorporate music that the student wants to play or sing. I am very patient and teach all levels and ages. Keyboard, Computer, Guitar, Uke, Amplifier, Microphone, Guitar and more. Everything you need to get started. Singing Lessons: Everyone can sing!!! I will help you develop your technique and expand your range, pitch and confidence! You will have a fun time learning about your instrument. I teach Classical, Blues, Jazz, Rock, Country, Musical Theater, and Pop styles, even though I am Classically trained. The technique will crossover into all styles. Song-writing: I will be happy to help you structure and develop your art. It's story telling at it's finest. Guitar: Have fun learning songs you like and get a great foundation too. I teach finger picking, tab, theory, scales, note-reading along with music you like. Miss MaryAnn is patient, kind and knowledgeable! Mary Ann is awesome! She is a great instructor, stays focused and fits a ton of instruction in each lesson. I've learned so much more in 5 lessons than I learned in 2 years trying to teach myself. I highly recommend her! 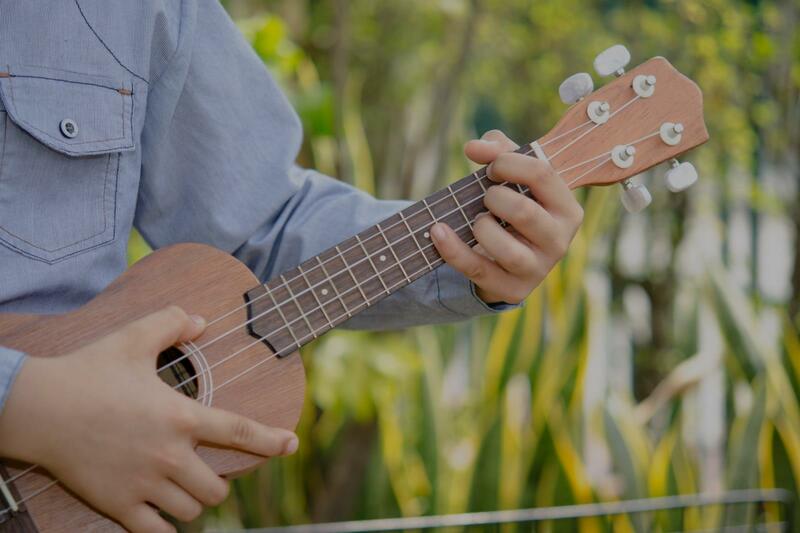 Ukulele is the perfect instrument for young students learning their first instrument. It's incredibly easy to get off the ground and start making music right away. For that reason, it's one of my favorite instruments to teach, and it's the instrument I recommend to first-time music students, even if they eventually want to switch to other instruments. Can't find a teacher in Elmo, TX? 7 years, so he had a good musical foundation to build on. Robert has good bandwidth and high resolution mic & camera." "On first meeting, Robert is easy to get to know. We discussed what my skills were and what to work on. All went well." He was eager to help me with anything he can. Courteous. Polite. Organized. Great teacher. Thanks Bobby!!!" "We had a great 1st lesson! Robert is great with kids ! My son left his lesson saying "Well that was fun! I can't wait for my next one !""